Stupid people are hard at it. Whatever they do, there are times in which they incite outrage. Someone shared this ‘brain fart’ it in a tweet early this morning, and later a friend of mine shared it on Facebook. I found it so distasteful and outrageous that I need to vent about it here. The highlighted text speaks for itself: airheads are hard at it. Meh! 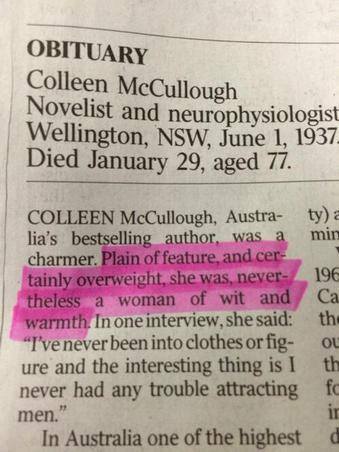 We Australians are saddened by Colleen McCullough’s passing. I’d like to say a few words about her and her work. 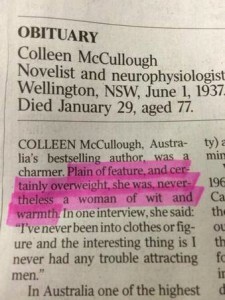 But first I need to get this off my chest: some airhead journo from “The Australian” or any other Murdoch newspaper (it doesn’t really matter; they’re all the same) decided to make a very ungracious comment about the late Dr McCullough’s physical appearance. I can’t bear to repeat it, but will share the incriminating evidence that has been doing the rounds. Pathetic is the first word that comes to mind, and then a flood of four-letter words. “The Guardian” published a column by Elle Hunt in the Australia Books Blog that captures the mood among those of us that admired Colleen and grew up enjoying her books. Some of the tweets that this article reproduces are a scream, and patently show that thinking people won’t buy a third-rate piece written by a dimwit. Such a comment on someone’s appearance in their obituary is what I call “Fifty Shades Of Non-Thinking”. Nuff said. What I do want to write about is what Colleen McCullough means to me: she’s the first Australian writer who opened my eyes to Australia when I was a very young girl living in Argentina. I first read a very poor Spanish translation from my mother’s bookcase, but a couple of years later I got hold of the English version and enjoyed it no end. The landscape and the consequences of a natural disaster had a few striking similarities with the Argentinian hinterland. I did fall in love with Father Ralph de Bricassart and felt for Meggie. Fee’s life and the decisions that she had to take became an eye opener into how life can be “unromantic” and yet full of love between a man and a woman. Colleen was an accomplished scientist and started writing after a relationship breakup (I can relate to that, even though I never finished what I started after that disaster in my love life). She was a ‘voracious reader’ who came from an Australian-New Zealander family, born in Central-West NSW. She worked as a teacher, librarian and journalist before she started her studies at Sydney Uni, where she graduated as a neuroscientist (I have to confess I didn’t know that about her). She had a remarkable academic career in the UK and the US—at the University of Yale, no less! Her first novel, Tim, was written in 1974. You can find her bibliography in countless websites, so I’m not going to bore you with that sort of detail. The Thorn Birds was her second novel and became an international bestseller that was later turned into a successful TV miniseries. Masters Of Rome is a superb collection of historical novels. I’ve never read it, but I applaud the fact that she chose to focus on the Republic, instead of revisiting the rather trite topic of imperial Rome. There’s a general consensus that Colleen did very thorough research on the topic. What is it that I have learned from her as a writer? How is she a kind of role model for me? I suppose that if I could choose, I would love to become one of those writers who becomes the readers’ darling and can make an independent living on her works. I’d certainly love Bittersweet Symphony—or any of my future works for that matter—to be made into film or a dazzling TV miniseries. Prizes? Sure, they’re welcome, but many times they don’t bring home the bacon. The critics? Yeah, I know they’re there, and that they’re to be listened to (or read) once, and then quickly forgotten.